The most common magnetic materials in use today are alnico, ceramic (hard ferrites), samarium cobalt, and neodymium. Each are made up of different elements used for different applications. A big step in the evolution of the permanent magnet materials used today came in the 1930’s with the development of Alnico magnets. In 1931, T. Mishima discovered that an alloy of iron, nickel, aluminum had a much higher coercivity than the best steel magnets of the time. 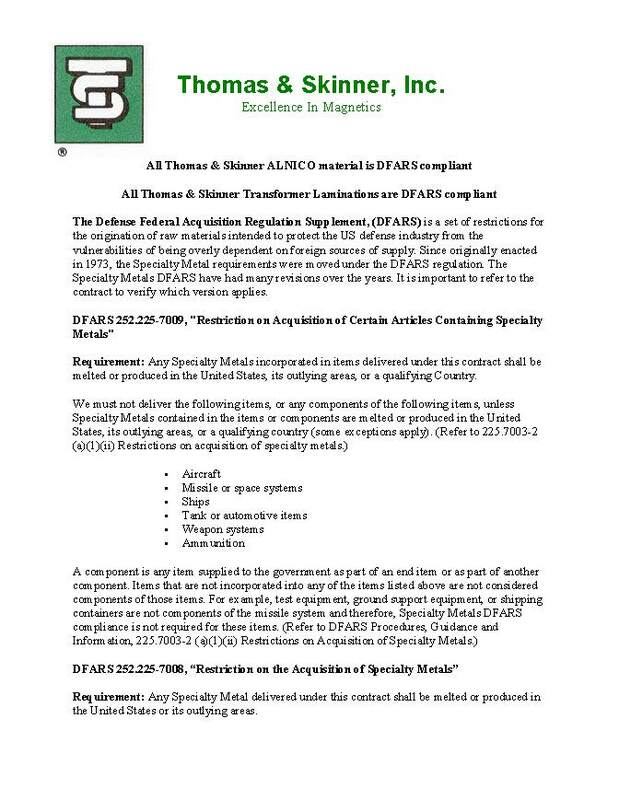 Further research created alnico, a term referring to a series of permanent magnet alloys which in addition to iron are composed primarily of aluminum (Al), nickel (Ni) and cobalt (Co). 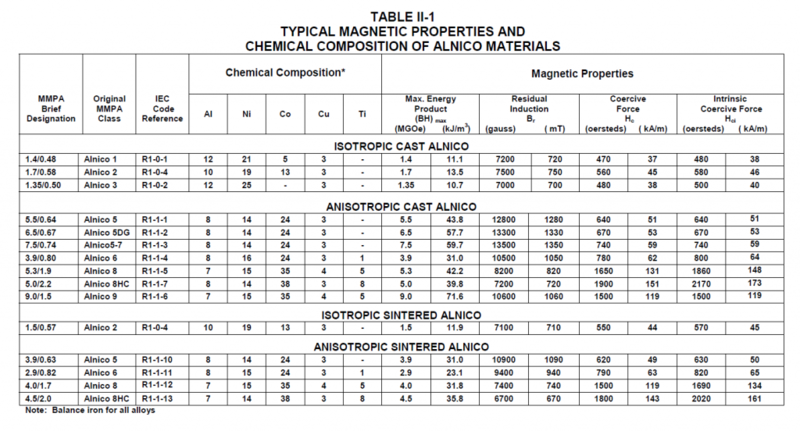 Various alnico grades with differing magnetic properties can be achieved by modifying the chemistry and manufacturing process. Today’s composition of alnico alloys is typically 8–12% Al, 15–26% Ni, 5–24% Co, up to 6% Cu, up to 1% Ti, with the balance being Fe. In addition to varying the alloy composition, specialized casting techniques can be used to achieve unique crystalline grain orientation. Examples of this are alnico 5-7 and 9. Once magnetized, Alnico magnets have between 5 and 17 times the magnetic force of magnetite or lodestone, a naturally occurring magnet which can attract iron. Alnico magnets have the benefit of having the lowest temperature coefficient, or temperature stability of all of the permanent magnet materials. Plus, they can be calibrated and have high residual induction.Before the development of rare earth magnets in the 1970’s, alnico was the strongest type of permanent magnet. Since that time, many applications using alnico have replaced it with less expensive or more powerful types of magnets. However, the fact that alnico can be used in very high temperatures (up to 930°F or 500°C) make them indispensable in certain applications. Alnico magnets are also ideal for corrosive applications and are commonly used for various types of sensors. They are stronger than ceramic magnets, but not as strong as rare-earth magnets. Sintered alnico magnets are formed using powdered metal manufacturing methods. Sintering alnico is suitable for complex geometries. Most alnico produced is anisotropic, meaning that the magnetic direction of the grains is oriented in one direction. 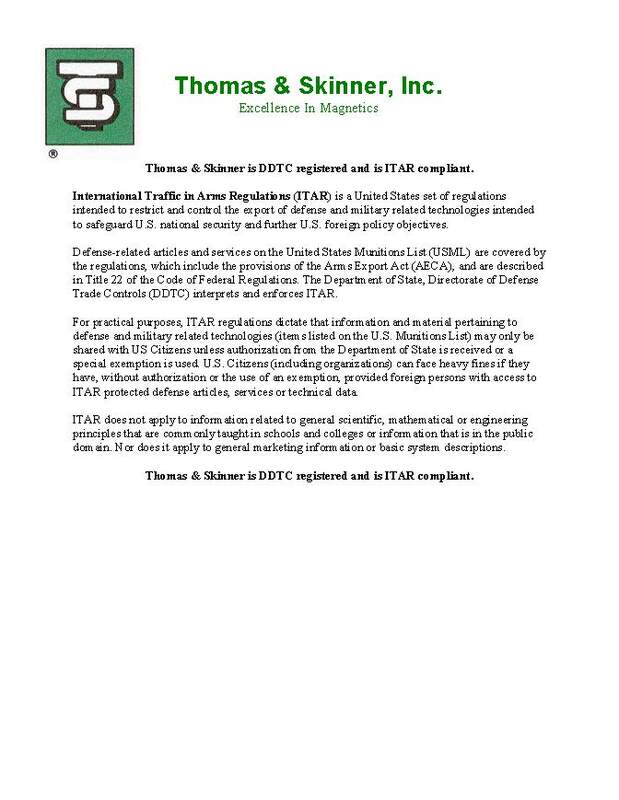 This orientation is achieved via heat treatment after casting or sintering. The process involves heating the cast or sintered part above its Curie temperature and then cooling it at a controlled rate in the presence of a strong directional magnetic field. Final shaping of the alnico materials is achieved by abrasive grinding and cutting where close tolerances are required. Ceramic magnets, like the ones used in refrigerator magnets and elementary-school science experiments, contain iron oxide in a ceramic composite. Most ceramic magnets, sometimes known as ferrite magnets, aren’t particularly strong. Ceramic permanent magnets are made from finely powdered barium ferrite or strontium ferrite formed under heat and pressure. Their magnetic strength is enhanced by aligning the powder particles with a strong magnetic field during forming. Ceramic magnets are somewhat comparable to alnico magnets in terms of magnetic force and have the advantage of being able to be pressed into various shapes without significant machining. However, hard ferrites are not magnetically stable at higher temperatures. They are typically used in magnets where price is a primary driver, rather than size or mass. In the 1970s, researchers developed permanent magnets made from powdered samarium cobalt fused under heat. Samarium cobalt magnets can be made to produce magnetic fields 50 times stronger than magnetite. 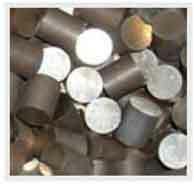 Samarium cobalt magnets can operate in higher temperatures, but cannot be calibrated. Samarium cobalt magnets are made mostly from samarium and cobalt, with small amounts of other elements such as iron, copper, zirconium and hafnium. The majority of the material is cobalt. They are typically used in higher temperature applications where the strength of rare earth magnets is still needed. They have a higher Curie temperature than NdFeB, but are also more expensive to manufacture. The newest permanent magnet material was developed in the 1980s using powdered neodymium iron boron (NdFeB). This type of magnetic material produces magnetic forces almost 75 times stronger than magnetite. These are the most powerful permanent magnets commercially available today. Neodymium magnets are made up of neodymium, iron and boron, with the majority being iron. They are the strongest type of permanent magnet available. While they have the highest magnetic field strength, they have a lower Curie temperature and are more vulnerable to oxidation than samarium cobalt magnets. Corrosion causes the material to crumble into a powder, losing their magnetic properties. Bonded or flexible permanent magnets are made from mixing magnetic materials with a rubber or plastic matrix. Nearly any magnet material can be used to create a bonded magnet. 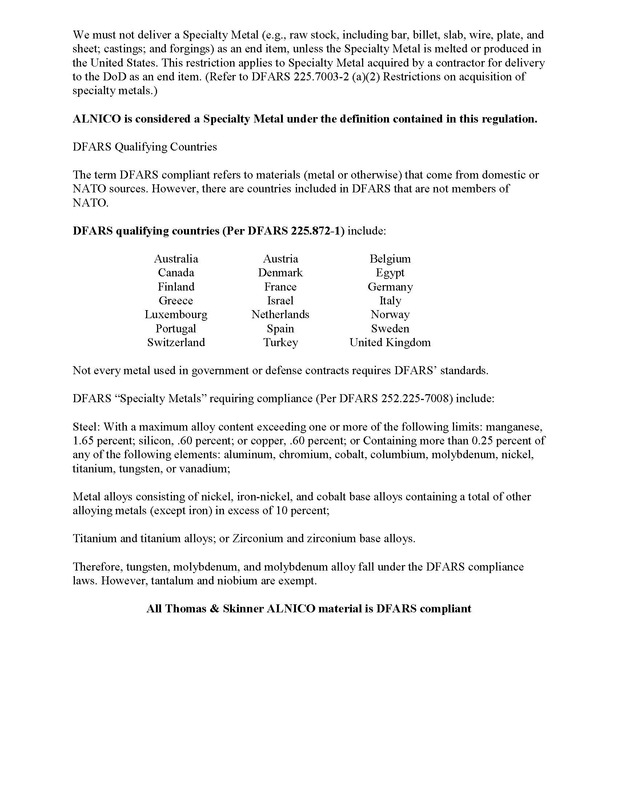 The most common bonded materials incorporate either hard ferrites or NdFeB. For instance, powdered barium ferrite or strontium ferrite can be mixed in a binding material such as rubber or a flexible plastic like polyvinyl chloride, to form a bonded magnet material. The magnetic performance of the bonded magnet can be impacted by the concentration level of magnet material to binder. Alnico magnets have the benefit of having the lowest temperature coefficient, or temperature stability,of all of the permanent magnet materials. 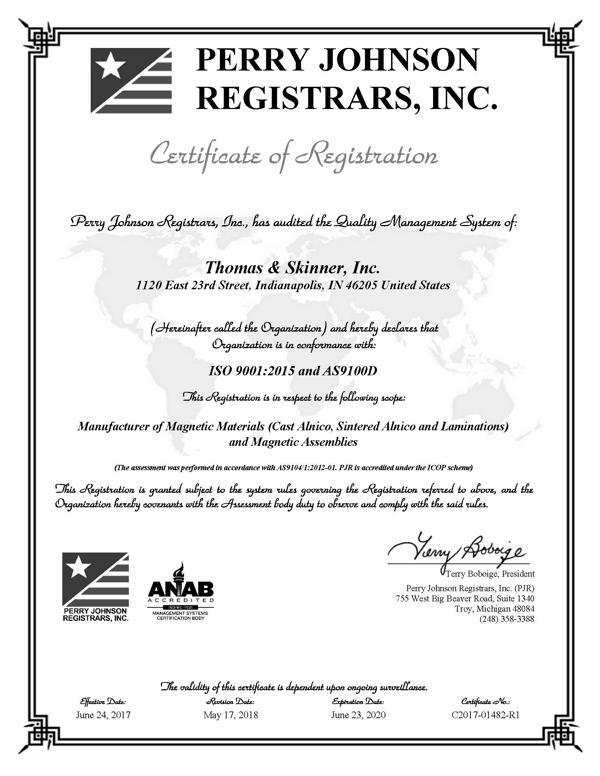 Thomas & Skinner is the world’s leading manufacturer of cast and sintered alnico magnets, magnetic assemblies, and transformer laminations. We are committed to providing our customers with the highest-quality, highest-performing magnetic materials available. Copyright 2019 © Thomas and Skinner inc. | All Rights Reserved.